Commercial space for rent is located in a magnificent building dating from 1989 in Jilska street. The house designed by a famous architect Antonin Wiehl has undergone costly reconstruction, during which care was taken to preserve historical elements. On the facade of the residential palace are located figural graffiti Mikolas Ales on the theme of war and peace. The house is linked with a rich history dating back to the fifteenth century. 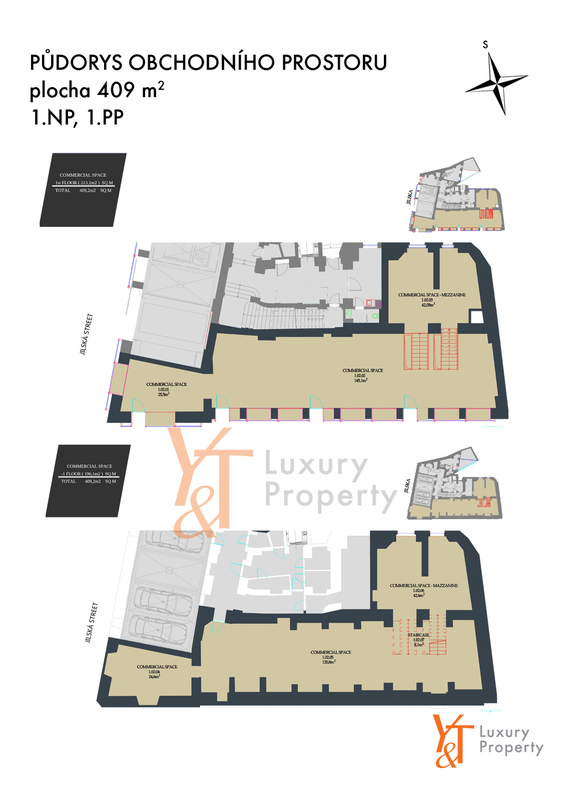 Commercial space is located on the underground floor and on the first floor with south orientation. The building is in a busy tourist area in the centre of Prague. Commercial space has two entry doors from the streets Jilska and Skorepka. The commercial space is suitable for a retail or refreshments with a focus on cold cuisine (Champagne bar). Jilska Street is in the heart of the Old Town and is the main tourist route.Within walking distance of the Charles Bridge, the National Class and of course excellent links to public transport.